September 7 Question: How do you find the time to write in your busy day? Well, I schedule writing time. Then, when life catches up to me, I ditch that in favor of the current crisis. When life happens, I write in the early morning hours for an hour or two. On days when the weather isn't cooperating or nothing major comes up, then I write for hours to make up the time. I discovered a handy dandy gadget for tracking words over to the NaNoWriMo site. This year is the first year I've set a major goal of 1,120,000 words for the year. At the start of the month, I was ahead. However, the past few days have not been too good for my writing. Thanks to my industriousness in the month of August, I am still in reach of my month goal, currently set at 97,000 words. That means I'll have to put in some extra hours beginning this week. My schedule, however, doesn't quite agree with that word goal. That means I'll have to make some tough decisions with the choices I'll have. Perhaps, it means my writing will have to be broken up into 2 shifts, morning and evening. However...I am not an evening person. I have put up a few index cards that remind me to write something each day, even if it is only 500 words. I tried writing on my phone with one of the handy dandy gadgets. That doesn't work, cause the autocorrect is the bane of my life. I haven't figured out how to turn it off yet. I have written a few posts to be scheduled on my blogs. When I can find the time. I guess this has forced me to think about what it is that I want to do. I'd rather write. Finding time to get the other stuff in my life done is what is the problem. Off I go to get the necessary stuff done, like decluttering, cleaning, cooking, going to town. Oh, that is a trip and a half. That's a whole day out of my day. At the least, four hours and can turn into six or eight hours, especially if we stop to eat. And we don't stop at fast food places. Now, don't get me wrong, I love my family and will do things for them, willingly. It's this goal of getting my books done. At least, the ones I've been working on for the past decade or so. I would like to say, at the end of 2016, that my books are done. D O N E. And start on one or two more with the ideas I've come up with whilst revising my current projects. Hmmm. Wonder how I can get the other stuff done whilst I work on my writing? Question of the month: What was your very first piece of writing as an aspiring writer? Where is it now? Collecting dust or has it been published? The very first piece of writing I ever did was a poem, back in the day. Wrote it during class when the teacher asked a question. That was my answer. As to where it is? Unknown. I gave it as a gift to an Elder who worked with the Indian Studies department at the college I attended. I liked her. She taught me a lot that I didn't know I was learning at the time. She always had time if she saw that we were troubled about something, gave gentle correction when needed and encouraged us to stick to the schedule at college. It was this piece that "sprang forth from my heart" that needed very little correction that caused my absence from the writing world for years after that. Cause shortly, it was to be my folly to mention it to the aforementioned girl who gave me the unwanted advice that all writing sprang forth needing no correction, no editing, yadda, yadda. My folly was I took it to heart. It's always been an inspiration? Nah, a revelation to me, that someone besides a teacher actually liked my writing. Just thinking of that now gives me encouragement to keep on. It only takes one, can mean so many different things. Well, that's my lesson for the day. Giigawabamin noongom! See ya later. Something I need to remember when writing. Some great tips. In January of this year, I did a New Year's resolution type plan which is something I normally do on my birthday. However, I'd been knocked for a loop and a half and entered a year of mourning, a tradition among my people. I don't strictly observe it since my mother was a Christian or "church" as it's so often termed nowadays. I haven't met anyone nowadays who strictly observes the mourning custom. Involves some things that are nearly impossible now, what with having to go out in the world and earn a living. I have now reached nearly half of my word goal for the year: 498,998 of 1,200,000 words. I have finally gotten my site "Niiganabiik's World" sorted out. Now, I just have to get the store set up and my first books up. I've got this big plan set out for what I hope to accomplish when the final books of my series are "out there for all the world to see" if they so choose. I finally swan dived less than gracefully, read "belly flopped," into the world of "author sites" and have a domain for my writer blog. Am in the process of cleaning up the site and updating it. For now, it's going to look like it always has, bloops and all. As I looked back over the past years of my life with my mother, I realize how much she supported me in my writing endeavors. I'd always imagined her here to see the finished stories. Well, she knows, or will know when the year is up. Right now, I am grateful for all the writer friends I made over the years. I haven't always been up on things so much this last year-spending a lot of time with family and touching base with offline friends. I guess the hardest thing to get used to was the change in my routine: Mom is no longer sitting in her chair, giving me the beady eye when I don't write for a while. She or I would make the first of three pots of coffee for the day and proceed from there. So, I guess this post is helping me face the success, or failure, of my life as a writer, without the support of my mother's belief that I could do anything I wanted, if I wanted it bad enough. "There's no such word as 'can't!' printed across my favorite picture of her is something I'm thinking of posting on my wall where I can see it every day. What's the best thing someone has ever said about your writing? A thoroughly, devious question. Best thing someone's said about my writing? Hmmm. Let Me See. I get a lot of comments from readers of my monthly column who enjoy my 250 words of early morning wisdom. Apparently, my editor gets calls from concerned readers when a column of mine gets mislaid, or more likely waylaid by those, oh, dast I mention them? Nah. Things have been going smoothly in my world for the past few months. Well, at least as far as the world building has been going. I've gotten some few comments from readers over to the JukePop Serials site. Those are more of the complaint type, so hardly worthy of being granted the title "best thing" though, it could be thought of as the best thing. I've managed to finish the entire two books on that site. The chapters will be going up on a fairly regular basis once my year of mourning is over next month. For those of you who don't know, my mother died last July, hence my rather haphazard fashion of writing. Or should I say, even more haphazard than usual. Out of respect, I've severely curtailed my writing activities. Ahh, I did get some fairly helpful comments from the Writer's Conference I attended last June. Woulda attended again, however...ditto the above. Mind, my mother was not traditional, though she held a lot of the traditions in high regard and had a respect for those who walked that Path. Including me...her number one daughter. We talked a bit about the Conference and what I learned, then dove into the subject of the garden, which, sadly, the crows had happily did their little crow hops all over, wrecking nearly everything. Tip: never believe those who say to put plastic sheeting over newly planted seeds before going off on a writing adventure. We did get to enjoy the ones from the raised bed garden, tomatoes-which I played the part of the bumblebees and got quite a few tomatoes out of it. My pepper plants only grew about the size that were perfect for the little people who might come visiting and have a hankering for peppers. And carrots. Sadly, I forgot to thin those out and I hope the little people enjoyed the boost to their delicate eyes. The rest of the plants I grew more from curiosity, eggplant- a pretty shade of purple, okra-which I had never seen until this year when it lay upon the frigerated shelves of my local grocery store. Bout the only thing I recognized was the lettuce. And the onions survived to be tossed about like playthings when the mama bear and her three cubs visited this spring. Ahh, that's another story I may tell on another day, most likely over to my storytelling site-Niiganab. 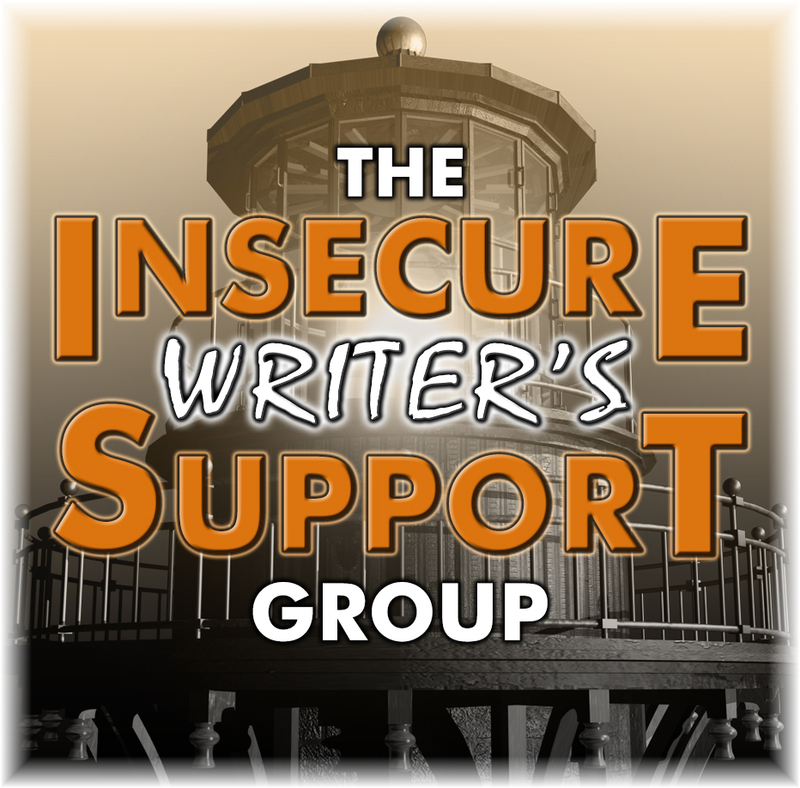 And none of this has anything to do with the question posed by my fearless leaders over to the IWSG site. **Well, if I'da been just a wee bit patient, I'da learned that the question is a source of topic ideas for those who need them. I'da learned that the date for posting is 06 July 2016. Ahhh, well, back to the ol' drawing board. 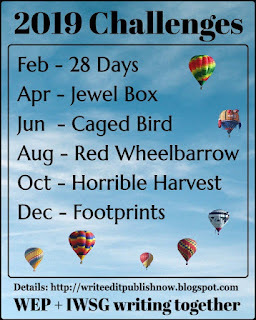 I started checking out the bloggers who’ve signed up for the A to Z Challenge. The next one was 'the NovelOrange.' She has a page of prompts which I decided I’d try one. This is the prompt. Chose to use this one as it resonated with me, sparked an idea. While strolling through a street fair, a mysterious woman in a yellow cloak thrusts a jar she claims holds people’s memories into your hands. Prompt idea from a fellow A to Z Challenger. This is just a short post which I may or may not develop further. Written in one half hour. I nodded my head, barely paying attention to Rachael. There was someone following us and I didn’t want to alarm her. I mean, it couldn’t have been a coincidence that the flash of yellow was always one booth away from us for the past half hour. I couldn’t tell if the person was a girl or not. All I’d been able to tell was the flash of yellow was a cloak, one of those hooded kind. The hood covered the head, and there was an added layer that covered half the body, like a cape. Rachael had barely consented to come with me to the fair. She’d been troubled with an old boyfriend who wouldn’t take no for an answer. Don’t get me wrong, it wasn’t anything to do with him being abusive or stalking her. Nah. It was much more simpler. She didn’t think they were ready to set up housekeeping yet. Tell you the truth, I think she was right. But it wasn’t my place to tell her that. I was a bit tired of giving her advice she wasn’t going to take. Figured if she stuck to her guns bout this without me saying anything, she was ready to be on her own for a bit. And that’s what I’ve been telling her since we were kids. I didn’t want to say anything cause her boyfriend did like to dress in those types of clothes. He was into medieval stuff. Cept this person wasn’t as tall. So what would be the point in saying anything to Rachael? A flash of yellow and I step in front of Rachael. It’s a woman who has floral tattoos on her forehead and cheeks. The inside of the bright yellow cloak she’s wearing is orange and her black hair goes down past her shoulders. I reach out to stop her when she pulls something out of her little cape. She shoves a jar into my hands. “Here’s a present for you from your Aunt. It holds some memories that she wants you to have.” She glances over her shoulder and steps back. Been busy in Niiganabiik's World. I've set a word count goal of 1,150,000 words for 2016. Yeah, that sounds like a lot. And it is. Revising 14 books, writing on blogs and my regular column is a lot of writing. I've used one of the year trackers Created by Svenja (http://svenjaliv.com). This really simplified things for me. Those 1,150,000 words works out to about 3,138 words a day. For the month of January, I've averaged 3,183 words per day. Not all new words, you think to yourself, since I've been revising. However, this is the year I'm thinking I'll be needing some sort of documentation of my work hours for the tax man next year. 700,000 words or 14 books written during many NaNovember months and one or two Camp NaNoWriMo months which are the basis for my word count. I decided I'd count those 700,000 once again cause I am rewriting many of them. This involves consideration of whether or not to keep the original words. So, Yeah, I'm counting them. Also have one of those handy dandy timers and a calculator as well as my trusty Scrivener and Aeon timeline. Works out well for me time-wise. I've discovered that I write about 900 words or so in an hour so I really only have to write about 2 hours or so a day. 98684 for January. All of the spiffy new thingamabobs and stuff are all in one place which makes it easier for me to work. I no longer have to hunt for what I want. Well, actually, there is one or two things I'm still trying to retrieve from the black hole of despair-my camera charger and the original copy of the first book I ever tried writing way back in 2003? Might have been 1998, Can't remember. Thus my hunt for that copy which I can still pull up on one of the machines that still run floppy disks. I've been revising Bagamose, which a few of you know is up over to JukePop Serials. And the short story collection "Stories of the People' is next. Shortly after that will be Storm Clouds" over on Smashwords. Now you may be wondering why I've done this like this. Leaving half written stuff up for all the world to see. Simple. I want to let beginning writers know that there are many different ways to get something done. That there is a method to my madness. Annnd, because having been in sales most of my life, I do know that there won't be all that much time to actually write new stuff. So, Now I'll have several books that are/will be ready for publishing on some sort of schedule for the next phase of my life-Selling those books. I've also been working on a website called "Niiganabiik's World" and it's really in the development stages. I don't have as clear an idea about the design as yet. I do know I want to have a store there as well as what I have already online. And I've been choosing from a few options regarding the blog over there. Which is going to add yet one more to my already full plate of five blogs. I'd really like to get my Storyteller blog "Storykeeper" up here. Ahh, decisions, decisions, decisions. Here's to all the writers who'll make progress toward their goals, no matter how small or large they've set for themselves.